Part 1/3: What is end-to-end recruitment AI? We’ve watched wave after wave of technology crash on the shores of recruitment. First, we brought job postings and resumes online to help job seekers and recruiters find each other faster and easier. Then we observed the advent of social media for recruitment and an increased focus on candidate experience and CRM in use by leading-edge companies in their talent acquisition processes. As employer brand became a fixture of articles, conferences, and entire platforms, companies from small startups to large enterprises began measuring the impact of recruitment marketing campaigns on their potential pipelines. Then came big data and its massive impact on the candidate and employee data points HR had been collecting for years, bringing with it new insights into hiring and succession trends. Looking back it’s clear that these increasingly sophisticated technology trends created the perfect environment for the advent of automation and then, Artificial Intelligence in recruiting and hiring. As companies (and the people within companies who do the actual hiring) have gotten their heads around the idea that we’re hiring people, they’ve adapted their mindsets to marketing to candidates as though they were consumers, which of course, they are. When someone is capable of being shown four additional pieces of clothing they might like after looking at a certain shirt, they begin to expect the same sort of recommendation and predictive functionality in their professional life. When a person can schedule their next hair appointment with a chatbot instead of a receptionist only available between the hours of 9-5, they begin to anticipate interview scheduling will be easier and available 24/7 with far fewer hurdles. As people meet soulmates via smartphone apps with sophisticated matching technology, receive reminders and follow-ups on how to care for their pets, and receive instant information about products…their expectations of the job seeking and application process change inherently. Today, as we sit at a 10-year record low unemployment rate of 3.7%, a 10-year record high voluntary quit rate of 62% and over 7 million jobs available arming candidates with the power to choose, ensuring we meet the expectations of candidates as they find their dream job is more important than ever before. Artificial Intelligence has come to stay in the world of talent acquisition and staffing. And while we’ve heard plenty of applications of AI as standalone benefits, fewer companies are exploring how AI can impact their recruiting process from beginning to end. So, what is end to end AI recruiting? As we discussed in the introduction, recruiting today has changed. And it’s not just about the advent of technology anymore. It’s about the people, the processes, the technology AND the economic trends completely transforming how we recruit, how candidates perceive our efforts and where we should put our more strategic effort. Again, our 10-year record low unemployment of 3.7% and 10-year record high voluntary quit rate of 62% make this an extremely challenging time to be a recruiter. In addition to a world-class employer brand, a great candidate experience, a candidate-friendly ATS and/or CRM and massive amounts of open positions, recruiters have to consider channels they never did in the past. For example, by 2020 the early career talent generation will make up nearly 50% of the workforce. If you combine Millennials and Gen Z, they make up the majority of the workforce. 92% of early career talent owns a smartphone and many companies are still not mobile-ready. In fact, the very definition of mobile-ready is changing rapidly. Back when candidates were plentiful, one-and-done autoresponders were enough to ensure a candidate stayed in the process. Today, applicants want constant feedback throughout the hiring process and crave reminders and tips to nurture them through to the interview. Candidates anticipate having all the information right at their fingertips before, during and after the interview to make their decision. When candidates are in short supply and retention numbers are getting lower by the day, re-apply becomes an incredibly important metric. If you can continue to ensure a candidate feels valued throughout their hiring process and even after they’ve been rejected from a particular role or decided against moving further along in your process, you increase your talent pipeline by not excluding qualified candidates from it. But, all the added responsibilities we’ve discussed that create a world-class talent acquisition process take effort, people, and bandwidth. To personally shepherd people throughout an incredibly high-touch process as we’ve described takes so much time it can strip hiring teams of strategic vision, assessment capabilities and can be downright impossible when it comes to high-volume hiring. Let’s break down the three pillars of recruiting to determine why they matter SO much. Candidate experience has been a constant drumbeat in the ears of recruiters and talent acquisition pros since the mid-90s but it didn’t start mattering to executives en masse until crowdsourcing and company reviews began to impact consumer brand. The candidate experience is now a fundamental cornerstone of recruiting, in short, because it cannot take place in the dark corners anymore. A candidate who has a bad experience will tell the entire world on Facebook. A candidate who has a good experience will maybe tell a friend or two. SMS texts for open positions. Reaching candidates in real-time ensures they see your opportunities first. Capturing their mobile number can help fill out applications steadily, giving applicant profiles a more comprehensive view. Easy, short, mobile-friendly applications through conversation. 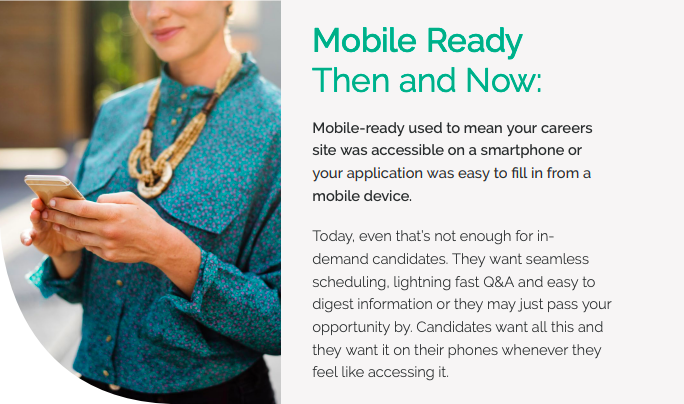 Candidates want to be able to quickly and easily fill out applications from mobile devices. If your applications are difficult or frustrating, they may abandon the opportunity. Accessibility to a company representative. Today’s jobseekers can afford to be choosy, so provide them with the option to find answers to their burning questions. Salary parameters, skills and qualifications, and general interview questions can be provided by a company representative and the more availability, the better. Transparency and reminders for next steps. Jobseekers are rarely applying for just one job. Make your process stand out by offering all the information they need to be successful in their interview, from scheduling ease to reminders about what to bring to the interview. Scheduling when they’re available. Candidates these days are almost ALL passive candidates. They need convenient times to speak with interviewers and those times are almost never mid afternoon or morning. Process/Status Updates, even if they’re a “no”. Communication has moved beyond autoresponders and letting applicants know they haven’t proceeded to the next stage is a must-do, not simply a nice to have. If you leave your candidates hanging, your brand will suffer. Post-Application/Interview Feedback. When hiring managers and recruiters take the time to coach candidates via post-interview or post-application feedback, they do two favors for the price of one. First, they give the jobseeker valuable, critical feedback to apply to their job search and second, they expand their talent pool by keeping the door open for the candidate to come back in the future. Opportunities to learn about the office environment or meet potential teammates. When companies truly plan to invest in their employees, they give them the opportunity to understand the culture and their future team during the hiring process. Introduction to company policies (for Diversity & Inclusion purposes). 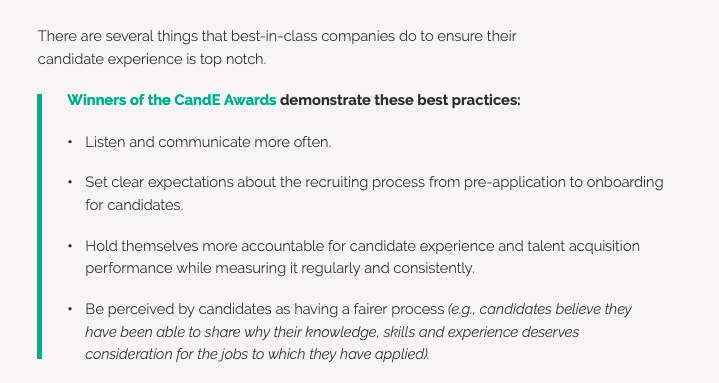 While candidate experience is an extremely important part of recruiting today, it is not the only element that needs to be examined. In fact, while candidate experience can often be conflated with applicant experience, it’s more often confused with candidate engagement, which is actually a very different thing altogether. Candidate engagement is the process and measurement of continually communicating with your candidate and how they respond to you in kind. In the quest for candidate experience, candidate engagement can be overlooked. However, automation can be super helpful in keeping your candidates engaged and focused on opportunities with your company. This step, though it might seem tedious, is helpful for hiring teams too. These elements give hiring teams the chance to get to know the person they’re considering too. Of course, these steps are still tedious and that’s why the next section, Automation, is a critical pillar to recruiting. Recruiters and hiring managers manage a lot of repetitive tasks when recruiting. These tasks are often time killers but necessary in order to bring top talent into the organization. While many recruiters work to create templates and processes that cut time, these concepts can cause embarrassing and affect candidate experience. For example, have you ever copy and pasted the phrase, “Dear Name,”? And then sent it…to the candidate who is not known by “Name”? That’s why automation tools can be helpful to hiring teams. The most obvious place that we can think about automation is in repetitive tasks. In the recruiting world – this can take place in the form of outreach to candidates, sending reminders, or even scheduling. In fact, automation can go further given the power of conversational AI. By gathering data through a text conversation, recruiters’ needs to phone screen candidates can be reduced. 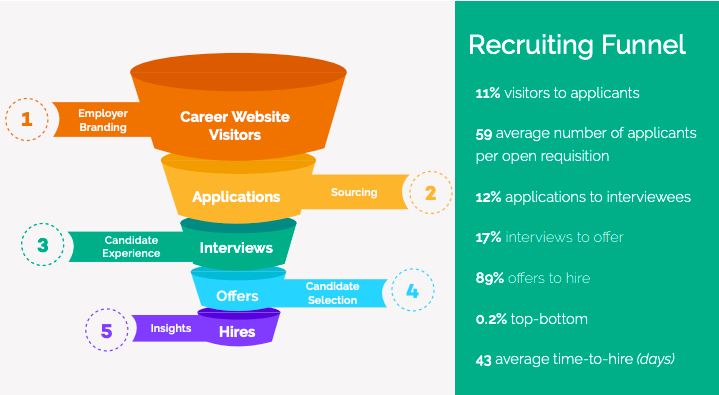 In fact, candidates can be tiered/ranked before a recruiter even sees them. It is important to note that this automated conversation means that the candidate still has a unified, and personal experience. Conversational AI is able to reach out and call the candidate by name while automating all the scheduling needs for further rounds of interviews. While conversational AI maintains a personal conversation by answering questions based on user’s requests, it also scales more effectively than a single recruiter. It can maintain hundreds of conversations without mixing candidates up and showing them jobs specific to their requests; by location, by job type, or even by jobs the candidate is qualified for. Conversational AI remains unbiased and as attentive to the hundredth candidate as the first. It is able to adapt to questions being asked at any point in the conversation (whether answerable or not). In addition, conversational AI compiles all this information to provide recruiters and hiring managers a concise view into a conversation the candidate has had with a digital recruiter. The candidate has a perception of a single point of contact helping provide them all needed information and arranging a conversation with the next round. This automation saves hundreds of hours of repetitive and administrative tasks. Today, employers are constantly looking for new technology to increase productivity and improve the candidate experience. That’s why many recruiters have turned to AI to help change the way that recruiting is being done, especially through conversational AI. Through traditional recruitment methods, once recruiters actively pursued candidates, they had to begin the tedious legwork of screening candidates and scheduling interviews, making it hard for them to engage with candidates and assist them throughout the process. 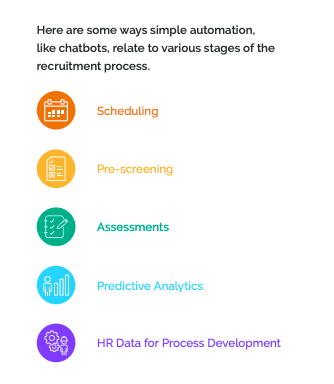 With conversational AI, recruiters are able to automate administrative tasks by capturing and screening candidates, and scheduling interviews and sending reminders. By automating tedious administrative tasks, recruiters are able to better source and engage with candidates, resulting in finding the best ones that will enhance their company. It creates a continuous stream of conversation between you and your candidate throughout their entire process. When interaction occurs, Conversational AI operates through a system or machine that helps humans speak to a system in a way that mimics how they would normally communicate with another person in real time. Conversational AI humanizes the recruiting process by implementing virtual recruiters who are available 24/7 to respond to questions that the candidate may have while guiding them through the entire process. It is redefining the way recruiters and candidates view the recruiting process while facilitating better hiring decisions and creating a positive and efficient process for both hiring teams and candidates. 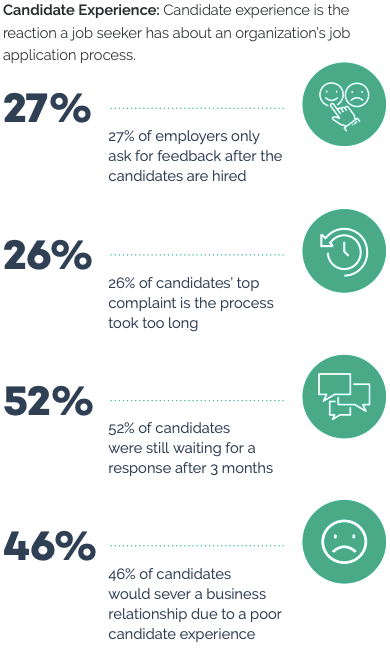 Candidates are more receptive to authentic communication, even if it’s automated because many HR and recruiting folk fear candidates are frustrated by obvious automation. Automation is just the beginning of successful intervention of tech in the recruiting process. As machine learning and natural language processing continue to advance, artificial intelligence is becoming the main focus. Altogether, it’s changing the way we work by altering the recruiting process to make it easier and quicker. AI alleviates the stress out of mundane tasks for recruiters and hiring managers by automating many of responsibilities that are time-consuming, resulting in a faster more efficient approach for companies to employ as part of their HR efforts. Much of what we use today is very young automation and AI tech, however, it can still provide valuable recruitment insights and make recruiter’s decisions better informed. Many businesses require AI to be integrated into their process in order to create a more efficient system. Through all the opportunities and efficiencies for us to generate data in tremendous amounts, nothing seems impossible. AI allows you to filter out and assess massive amounts of data based on candidates skills through their resumes and social media profiles into information that is easily digestible, helping recruiters match the right opportunities with the right people. It can cut out the bias and risky decision-making to pinpoint the best candidates while enabling recruiters to focus more of their efforts on where they can do the most good. In the end, you’ll gain valuable insights and data that can set you apart from your competition.